Author Alexandra Diaz. Photo courtesy of the author, credit to Owen Benson. 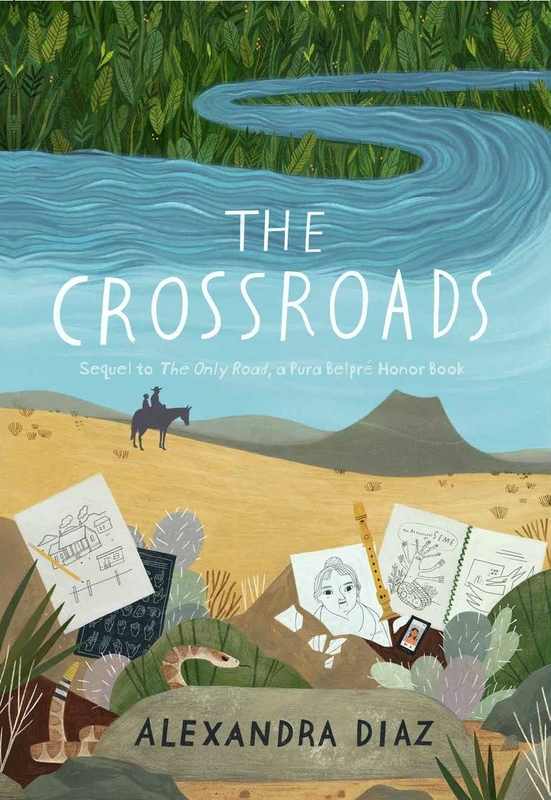 The question, posed by award-winning children’s and young adult author Alexandra Diaz, is at the heart of why she chose to write the book, “The Only Road,” which has received numerous awards — including being named the Pura Belpré Honor Book and an ALA Notable book — since it was published in Oct. 2016. The novel details the journey of two young child migrants, Jaime and his cousin Ángela, as they make the treacherous trek to the United States fleeing the gang violence that resulted in the death of Jaime's cousin, Miguel, in their village in Guatemala. The book is important at a number of levels. In a time when division about the policy that determines what happens once children and families reach the border is at an all-time high, little is still known and understood of the context of those children’s and families’ journeys: the why of the sacrifices many people make to attempt the border crossing. “I think it’s very important for children and adults to be aware of what is going on in the world around them, especially when some of these things are affecting their current world, so even though you may think, 'Oh Central America is so far away, this is not affecting me,' but the fact is that it is,” said Diaz. The thousands of unaccompanied minors from Central America who first arrived at the border and came to the attention of the general American public in the summer of 2014 has sparked an ongoing “crisis” at the border — though for whom the situation is a crisis depends much on the politics of the individual. But there is “some misconception” about why migrants are coming to the U.S., said Diaz. Some feel that the migrants who make the journey to the U.S. are impelled by a desire to take advantage of the U.S. or take jobs from U.S. citizens. But that perspective fails to take into consideration the testimonies of the migrants themselves — a perspective that Diaz hopes to illuminate through her fictional work for a wider audience. “It’s definitely something that I want to bring awareness to, and to have people realize that... people are not just coming here for silly reasons. They’re coming here for life and death reasons,” said Diaz. But, as with all children’s or young adult literature, the level of detail to describe that life and death reality is limited, and has to factor into the content of the writing itself. Diaz said that in order to ensure that the book was accessible and appropriate to young readers, she tried to use terms and ideas to describe the threats and violence the children faced in terms that could be interpreted at different age levels. “Pretty much everything that happens to my protagonist has happened or could have happened to other people,” said Diaz, who did “extensive research” to ensure that the novel was fact-based. Although Diaz did include a dog who traveled with the children in the plotline, she said that it’s those little touches and embellishments that are a byproduct of the “very active” imagination which first led her as a young girl to start writing. Diaz said that “The Only Road” has had an impact in schools where it has been used, and she herself has done numerous school visits in person and by Skype to talk about the story and her writing process with students throughout the country. Even students in a class she talked to in Maine, she noted, who are “geographically about as far from Central America as you can get within the United States,” were interested in understanding more about the immigration issue. Ultimately, Diaz said, the power of fiction is to create that direct, empathetic connection, and to depict real situations in a way that allows for more freedom on the part of the author to bring those characters to life. “When it’s in a character's point of view, you really feel for him or her, and you can say, ‘Oh my god this is really hard,’ I feel like you sympathize more,” said Diaz, who admitted that she even dreams about her characters - at times meeting them or sighting them from afar, sometimes embodying a character herself. “You are always going to receive discouragement and negativity from people, and you need to set that aside and if you want to be the writer, the dancer, the singer, then use every opportunity you can to be the best writer, dancer, singer that you possibly can be."